Want to know anything and everything about North Fort Myers and the surrounding area? 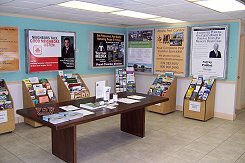 Our Welcome Center is the place to go! 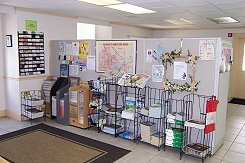 With hundreds of really informative publications, plus brochures, maps, coupons and more, and staffed by friendly, knowledgeable folks, you’ll find just what you need. We’re are located on the grounds of the famous Shell Factory and Nature Park, so you can’t miss us! Drive in the main entrance. When you come to the BIG shell at the entry, just look to your left to find our Welcome Center and Offices. We’re open Monday thru Friday all year.